I'm out of Ecuador for a bit here. I'm visiting my family and suffering through the heat wave in the Great Lakes region of the States. Many figure I'm used to the heat. But this is worse than Ecuador, even worse than my Ecuadorian jungle town, Tena! Part of the difference is that in Ecuador we have 12 hours of daylight year round. Sun comes up at 6 am and is down by 6:30 pm. So there just aren't the daylight hours to overheat the day. And the nights are long and cool. We don't even need air conditioning...well, there are a few days when it'd be nice. The high altitude of the Andes also affects the weather. Most people can hardly believe they'd need a sweater on the equator. I guess if I lived on the coast of Ecuador I might be more accustomed to the high heat and humidity. Sure have been dreaming of Ecuadorian weather these last couple of weeks! But I'll brave the heat to spend some time with my family and friends. It's been so nice to see everyone! One of the hard parts about living in Ecuador is that I've met so many people from all over the world, and it's sad that I can't see ALL my friends in just one place. On our way to Quito for our flight to the States, we stopped in Chaco to visit some friends. We had a nice time and enjoyed the beautiful scenery. This photo really doesn't do the view justice. I have been thinking about some of the things that I regularly see and hear in Ecuador that are just out of the ordinary. I wrote down some of these things, but I know there are so many more. Check out my list; and if you've been to Ecuador and can think of other interesting superstitions or traditions from Ecuador please use the comment form at the bottom of this page to tell us about it. 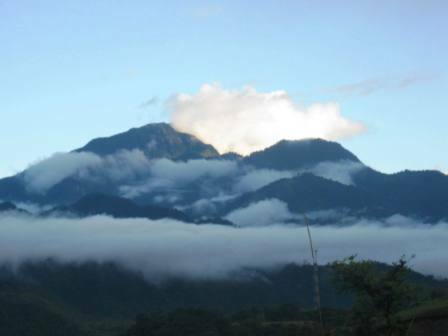 Another real estate opportunity for someone looking to live in the mountains of Ecuador. This is a beautiful country villa with possible income potential through rental or a commercial business. I'll be back to Ecuador soon. For now we're doing the full on American experience for my son...might even squeeze in some camping and Disney World.